One of the most popular activities there is, who doesn’t love a bit of Zorbing? When you combine our Zorb Balls with our inflatable water pool you can run, roll, slip, spin and tumble without getting a toe wet. We’ll bring the pool and the balls, you just need to bring your energy and sense of adventure and excitement. Watch and laugh as everyone involved gets mixed and mashed as they try to keep their feet inside the Zorb Ball. Zorb Balls are an ideal activity for parties, corporate days, team-building events, fund raisers, school fairs or festivals. 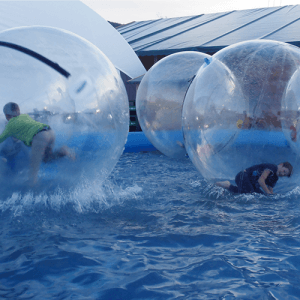 To hire Zorb Balls call 07717 532558 or 07770 933689 or click the Hire Now button. An outdoor space with a minimum of 12m x 8m of usable area. Access to a water supply within 50m of the site. If you have any questions regarding Zorb Balls, please get in touch.